Regeneration is inextricably linked to the past. If we ignore history we are doomed to repeat it, so goes the saying. The artist's impression of the view from Princes Street of the unbuilt Civic Hall. Copyright Swindon Collection. You have to go all the way back to a rainy day in 1971 to pick apart the story of Swindon’s last major regeneration project in the town centre. 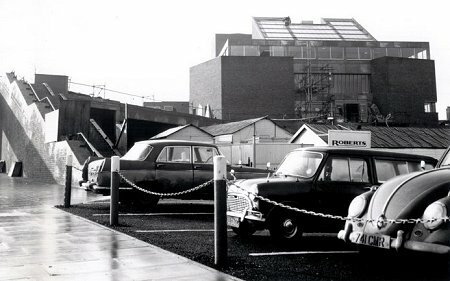 The confidence of the new plan for the Civic Centre development was so that the main phase to be completed, the Wyvern Theatre, was officially opened by Her Majesty The Queen and His Royal Highness Prince Philip on 5th November 1971.In driving rain, the ceremony was conducted with the dignitaries sheltering under the pavilion in Theatre Square. If ever a symbol for the difficulties of a major regeneration project is needed, a downpour on opening day (Guy Fawkes Night indeed!) fits quite well. 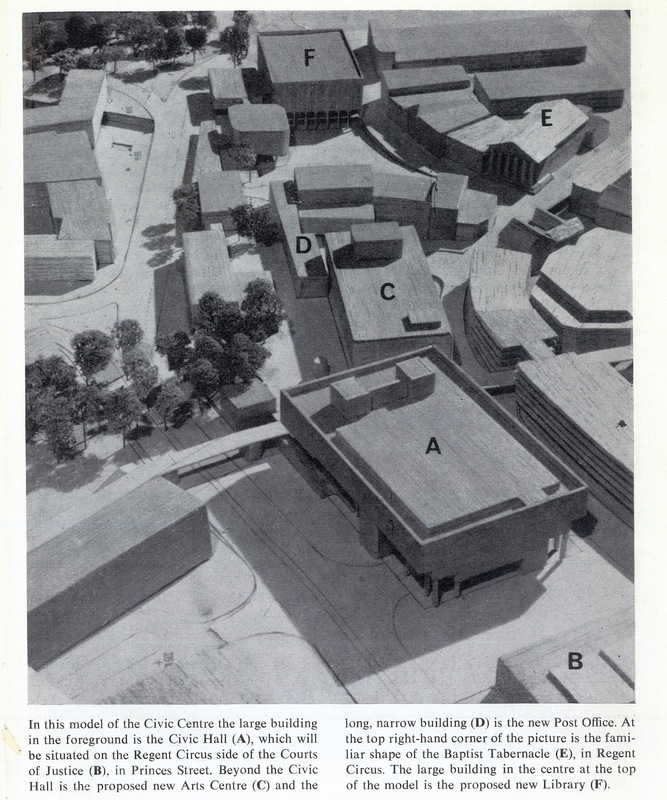 The scale model of the intended development, which included a new Central Library, which was eventually built. Copyright Swindon Collection. The Civic Centre project first arrived in the vision of Swindon’s planners in 1965, with architects Casson, Condor and Partners being asked by the local authority to produce a detailed brief for the works. They presented a document and a proposed development that was very much in the thinking of the sixties, strict segregation of traffic and pedestrians, overwhelming use of reinforced concrete and steel to create large spaces and a multi-storey carpark. The project aimed to create a hub of all the council-provided facilities in one area. The location was key, between the Town Hall to the south, the main shopping district, Regent Street to the west and a new dual carriageway to the east (Princes Street) forming the main transport route as part of a new ring road. The space that was to be occupied by the new Civic Hall was left vacant and still exists as the Wyvern Car Park. Copyright Swindon Collection. The original plan called for a theatre (originally designated an arts centre), library, post office, shopping arcade and civic hall. The access to all these was by large pedestrianised spaces and links east towards Spring Gardens and west to Regent Street with walkways raised above the traffic and streets below. Theatre Square was completed, with shops and cafes on the ground floor, and offices above. Unless you were around to see the building works, you might not know a network of underground corridors and sub-basements exists beneath Theatre Square. These act as emergency exits and most importantly link to a loading dock underneath the main doors of the Wyvern Theatre for deliveries by road. The pride on display with the opening of the theatre could also be interpreted as relief, as for several years up to 1971, Swindon was without a professional theatre.The previous facility large enough to accommodate full-scale productions was the Empire Theatre on the corner of Groundwell Road and Clarence Street, now where La Dolce Vita restaurant is.The confidence of the grand opening was to be undermined in the following years as the plan for the Civic Hall was dropped as the money ran out. By the mid 1970s, attention on regeneration had moved to the Brunel shopping Centre, with its railway station-inspired architecture of vaulted trainshed roofs and brushed steel supports.The Civic Hall would have been on the land now occupied by the Princes Street carpark. 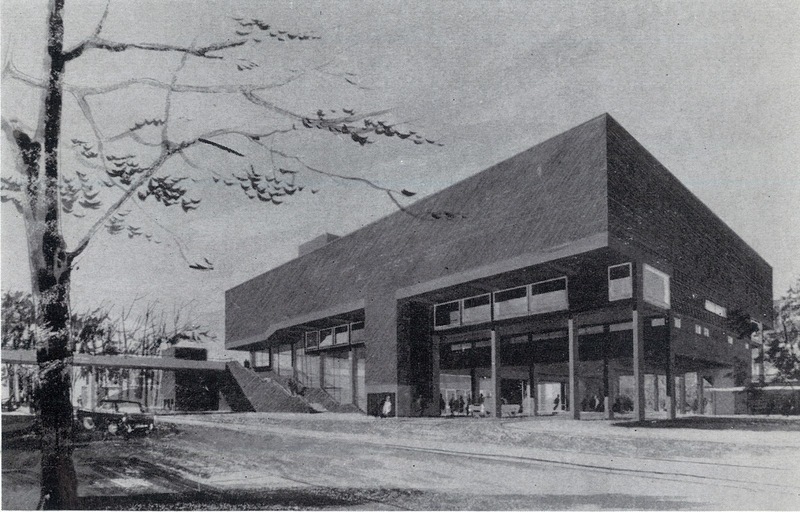 On the same level as the Wyvern Theatre, the building would have contained two halls, the larger with a capacity of up to 2000 people and smaller for a maximum of 300. Both spaces would have been fully-serviced, with bars, kitchens, cloakrooms and offices, depending on whether a wedding reception, orchestra performance, or conference was taking place. The larger hall was specifically designed for the accommodation of an orchestra, but was adaptable, with a dancefloor able to be laid down if Swindon decided to put it's dancing shoes on! The Theatre Square and Wyvern Theatre were completed as expected in the initial plan. The Wyvern carpark would have extended across Regent Close and into Regent Place, with the elevated walkway carrying on to Regent Street. 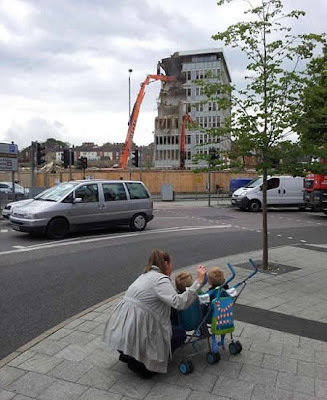 Swindon came tantalisingly close to a full regeneration project being designed, commissioned, constructed and completed, but that one piece of the jigsaw, the Civic Hall, was not to be. The library did still happen, but we had to wait until 2008 to browse its shelves. With the demolition of the former Swindon College, groundworks on the massive Union Square project and contracts signed for the Oasis Leisure Centre rebuild and expansion, Swindon has a platter of regeneration to get its teeth into over the next decade. "It took a while.... but they got it right." To see more images from the Central Library's fascinating photo collection, visit the Swindon Collection's Flickr here.